World War II in Color: Oberfeldwebel Johann Schwerdfeger, the Inspiration for "Cross of Iron"
Oberfeldwebel Johann Schwerdfeger, the Inspiration for "Cross of Iron"
Formal studio portarait of Oberfeldwebel Johann Schwerdfeger, a pre-war professional soldier, probably created in connection with his award of the Eichenlaub zum Ritterkreuz des Eisernen Kreuzes (Oak Leaves to the Knight's Cross of the Iron Cross), received in 14 May 1944 when he served as a Zugführer (platoon leader) in the 1.Kompanie / I.Bataillon / Jäger-Regiment 228 / 101.Jäger-Division. Schwerdfeger soldiered from 1935 to 1937 in Infanterie-Regiment 84, and in 1939 was transferred to the third company of Infanterie-Regiment 186 of the 73. Infanterie-Division, at the Polish Campaign's start. In June 1942, after serving in Jägerersatzbataillon 75, Schwerdfeger joined Jäger-Regiment 228 of the 101. Jäger-Division, who fought in the Don Bend, at Rostov, and at Maikop, in the Caucasus, and joined the retreat through the Kuban and the Taman Peninsula. On 17 May 1943 Schwerdfeger was awarded the Ritterkreuz (Knight's Cross) for his extraordinary bravery in the battlefield. 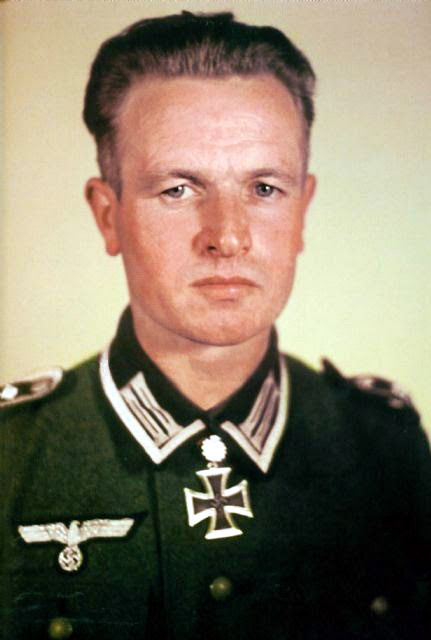 In April 1944, in the breakout from Hube's Pocket, he was severely wounded, and was awarded the Eichenlaub for his Ritterkreuz; moreover, Sergeant Schwerdfeger also earned two Panzervernichtungsabzeichen (tank destruction badges), meaning that he singlehandedly destroyed two enemy tanks with hand-held weapon. Schwerdfeger was able to recover from his wounds sustained in Hube's Pocket and served the remainder of the war. He passed away in December 2015. The novel, "The Willing Flesh", by veteran Willi Heinrich, and the famous World War II movie "Cross of Iron" (based on the novel), is generally recognised as being loosely based on Schwerdfeger's experiences as an NCO in Jäger-Regiment 228 in the course of that unit's retreat through the Kuban and Taman Peninsula in the late stages of the war. If this is "Steiner", he is a worthy model!